Description: Adult woodlarks have reddish-brown crowns and upperparts with black streaks. Their rumps are brown and the wings have pale tips and edges. Flight feathers are dark brown and the tail is dark brown with black stripes and white tips. Woodlarks’ underparts are buff coloured, their breasts are streaked with black and there are grey streaks on the flanks. Woodlarks have pinkish-brown bills, dark brown eyes and pink legs and feet. Their hind toes have a longer claw. 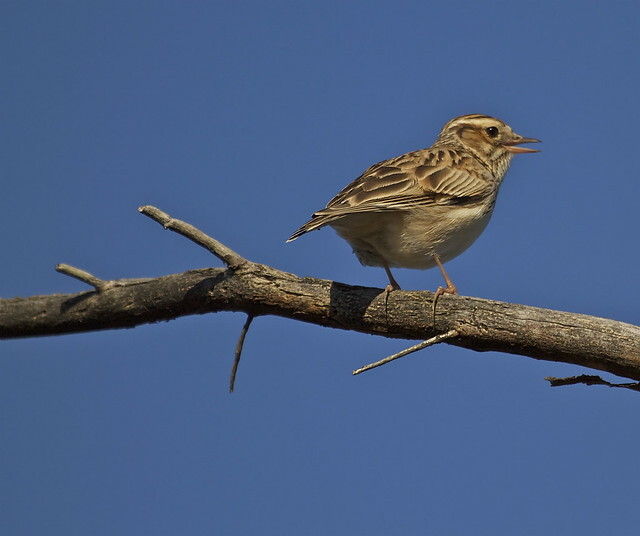 Adult woodlarks look similar except the female is smaller than the male while juveniles have a scaly pattern and the breast is more spotted than streaked. Nesting: Woodlarks nest on the ground in a deep hole amongst thick vegetation. The nest has a lining of leaves, pine needles and moss covered with fine grasses. The male may help with making the hole, but the female finishes the nest build. Woodlarks lay 3-5 creamy white eggs speckled with brown. They are incubated by the female for 13-15 days. The chicks are fed by both parents and they fledge 11-13 days after hatching, leaving the nest a couple of days later. Where to see them: Woodlarks are found mainly in eastern and southern England. They can be seen all year round on heathland and short grassland near the edges of woods. Did you know? It has been speculated that Robert Burns’ poem To The Woodlark is actually about a tree pipit as woodlarks are rarely seen in Scotland and Burns never travelled south of Carlisle.